AMBASSADOR'S BLOG - IS THERE A "REAL" CHRISTMAS? I was interested to see Chris Wilson's blog about snow in Beijing. It's been chilly in Kyiv too: when I arrived back from London this week the day-time temperature was minus15 degrees Celsius. After several heavy falls of snow, the Ukrainian capital is sheathed in drifts. A city-centre walk generates crisp, underfoot crunchiness. As in the UK, more snow is forecast this week. In fact it's snowing heavily as I write this. Although I'd welcome some of the bright blue sky Chris mentions in Beijing, it is difficult to imagine a whiter Christmas than we expect here tomorrow. 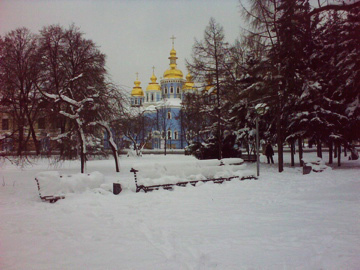 Brits working in Ukraine have the privilege of two Christmases. Like many inter-cultural experiences, it's a reminder that reality can be interpreted in many ways. Arguably, neither 25 December nor 7 January is the "real" or "original" Christmas - it depends where you're standing and how dates work. For myself, having enjoyed a family celebration in Manchester on 25 December I shall be in Kyiv for the Orthodox Christmas on 7 January - just ten days before the first round of the presidential elections on the 17th. 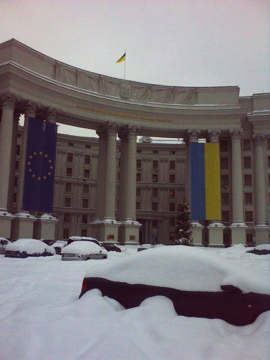 As in many other countries (see eg this blog from Martin Uden in Seoul or this one from Gary Benham, based in Pretoria) 2010 will be an important year for Ukraine, with the prospect of the elections bringing a new impetus to the governance of this important European country. Let's hope that happens. З Новим Роком та Щасливого Різдва (Happy New Year and Happy Christmas) to all of you.